[Sound and Vision]: We Are The Best! After a lengthy detour into experimental narratives and Christian allegories, Swedish filmmaker Lukas Moodysson has returned to the effusive coming-of-age dramas of his early years in We Are The Best! (Vi Är Bäst! 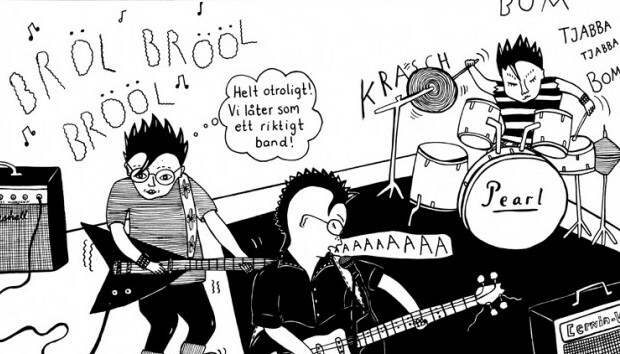 ), based on wife Coco Moodysson’s comic book Never Goodnight. Stockholm. 1982. Punk is dead. Or at least, that’s what everyone keeps on telling Klara and Bobo, two punk-obsessed best friends who are shunned at their high school. While boys are either listening to Joy Division or playing denim-clad rock and girls are dancing to The Human League, opinionated Klara (Mira Grosin) and mild-mannered Bobo (Mira Barkhammar) are more interested in spiking their hair, creating dioramas of disaster zones and gossiping over punk fanzines. Reacting to their dislike of P.E. lessons and in an effort to annoy local rockers, the overly-macho named Iron Fist, the girls pick up bass and drums at their youth centre and write the song, ‘Hate The Sport’. The problem is neither of them know how to play. At all. That’s where Hedvig, played by Liv LeMoyne, comes in, whom Klara and Bobo spot performing a classical guitar piece at the end of term talent show. More than her evident ability to play her instrument though, the girls are impressed by Hedvig’s resolve to continue playing undeterred by the heckles and jeers from the audience. She is a year older and, unlike Bobo and Klara, a devout Christian, but she is also an outsider and this forms the basis of an unlikely friendship as the girls introduce her to punk music and she brings actual melody to the band. Together they navigate the uncertain terrain of pre-adolescent life, cutting Hedvig’s hair (to hilarious consequences), crashing their first party (to embarrassing consequences), fighting over a boy in a neighbouring punk band and inciting a riotous crowd at a youth centre Christmas showcase along the way. While this is just the bare bones of the story, what really brings We Are The Best! to life and sets it apart is its balanced mood and attention to detail. Moodysson catches everything with fly-on-the-wall type voyeurism, insinuating the personal dissatisfactions of adult life and the difficulties of being a high-schooler without ever hitting you over the head with it. You genuinely empathise with the punk trio and it is their childlike motivations and unwillingness to be ignored which makes We Are The Best! so funny and charming. This is not a film about snotty punk rebellion, but more about the joy and liberation found in starting up your first band and the strong bonds formed when you do things your way. People may tell them how to look, how to behave and how to play, but Klara, Bobo and Hedvig do things their way and that is what truly makes them The Best. We Are The Best! is in cinemas now. This entry was posted in Sound & Vision and tagged Coco Moodysson, Coming Of Age Drama, Film Review, Foreign FIlm, Lukas Moodysson, Never Goodnight, punk, Swedish, Vi Är Bäst, We Are The Best. Bookmark the permalink.